The first edition of Tanada and Kaya’s Insect Pathology is the standard reference in the field for researchers and both undergraduate and graduate students and is well known worldwide among entomologists. However, the field has seen rapid advances in the 20 years since its original publication, and the new edition brings together an essential and updated resource for researchers with 13 chapters edited by Fernando E. Vega and Harry K. Kaya. Many of these advances involve new insights on ecology as well as phylogenetics and molecular biology of viruses, bacteria, fungi, microsporidia, nematodes, and protists. All these aspects, as well as basic biology, diagnosis, infectious process and pathogenesis, host response, transmission and more, are covered by renowned experts in their respective fields. 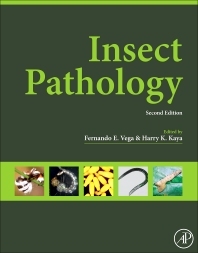 The second edition of Insect Pathology includes chapters on the history of this discipline, principles of microbial control and epizootiology, diseases of beneficial insects, host resistance, and Wolbachia. This thoroughly illustrated and up-to-date revision will provide insect pathologists, entomologists, microbiologists, mycologists, nematologists, protistologists, ecologists, and practitioners of biological control of insect pests with a solid and much-needed reference. University of California, Davis, U.S.A.